and the little kitchenmaid was allowed to stand behind the door, now that she was a Court-cook. 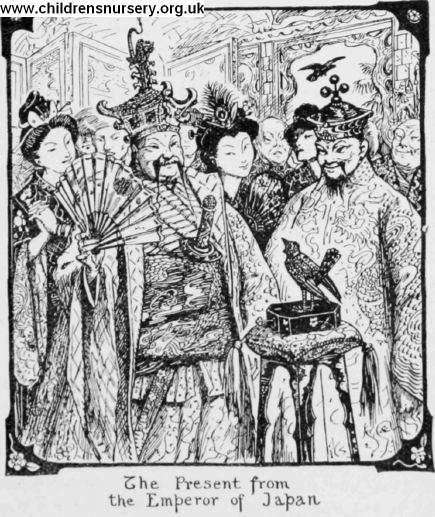 Everyone was dressed in his best, and everyone was looking towards the little grey bird to whom the Emperor nodded. Emperor was so delighted that he said she should wear his gold slipper round her neck. But the Nightingale thanked him, and said she had had enough reward already. 'I have seen tears in the Emperor's eyes—that is a great reward. An Emperor's tears have such power!' Then she Bang again with her gloriously sweet voice.